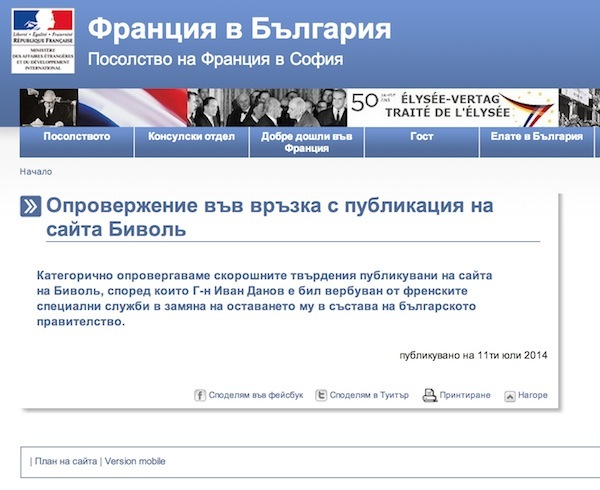 An official statement of France, posted on the site of the Embassy in Sofia on July 11, denies Bivol’s lead that Bulgarian Minister Ivan Danov might have been recruited by its secret services. “We firmly refute recent claims, published on the site Bivol, according to which Mr. Ivan Danov has been recruited by French secret services in exchange for keeping him as member of the Bulgarian government,” the message reads in French and Bulgarian. The Minister of Investment Planning should be in the crosshairs of the French authorities for improperly receiving 14,400 euros. There are many examples of French citizens prosecuted to the full extent of the law for the same offense that Ivan Danov committed – abuse of unemployment benefits. However, to date, no one has bothered the Bulgarian Minister. These facts, Danov’s contacts with senior former police officers, as well as information from other sources, fueled the logical assumption for possible “exchange of services” between the Minister, who screwed up, and the French authorities. The Embassy’s denies this, but the question remains as to why Danov is not concerned with French justice. According to information of Bivol, the affair “Danov” is personally overseen by the Head of the “Preventing and Combating Abuse and Sensitive Cases” unit of the French Employment Services, Ms. Rejane Biolet. A year ago, Bivol revealed that between September 2004 and May 2005, Ivan Danov has unlawfully received unemployment benefits in France, while he lived, lectured and was doing business in Bulgaria. Danov has submitted false information to the French Employment Services every month and has received in the form of welfare about 14,400 euros. Danov, himself, did not deny before media that he had received the money, but claimed he was unaware of the deposits and had even forgotten about this account. He later complained that the account had been drained and alerted French authorities about it. It should be noted that the Minister cannot be prosecuted in France as the French law includes a five-year limitation for false declarations and it has expired. However, the limitation for administrative proceedings to recover unduly paid amounts, which in France is 10 years, has not yet expired.